TAMPA -- Hurricane Irma caused record-setting flooding in Jacksonville, Florida, as it moved over the state on its way to southern Georgia. The storm weakened to a tropical storm on Monday afternoon, according to the National Hurricane Center. According to the National Weather Service, storm surge flooding in downtown Jacksonville exceeded a record set during Hurricane Dora in 1965 by at least 1 foot. A river gauge downtown in the Atlantic Coast city measured 3 feet above flood stage. "Move to higher ground now," the weather service warned people near the St. Johns River. Authorities told residents near the river to leave quickly as floodwaters rise. They said the river is at historic flood levels and reached the maximum crest around 2 p.m. at high tide. Meteorologists with the National Hurricane Center say a "slow fall" water recession of about 1 foot will be seen during the evening hours. There will be a gradual rise and fall of water over the next several days. The Jacksonville Sheriff's Office warned people in evacuation zones A and B along the St. Johns River to "Get out NOW." On its Facebook page around 10:30 a.m., the sheriff's office told those who need help evacuating to "put a white flag in front of your house. A t-shirt, anything white." Rescue teams were ready to deploy. Meanwhile, a flash flood emergency has been declared in Atlantic Beach, just outside of Jacksonville. According to CBS affiliate WJAX-TV, the water level is expected to rise another 1 to 2 feet. Winds will then switch to the south and push water into downtown Jacksonville. 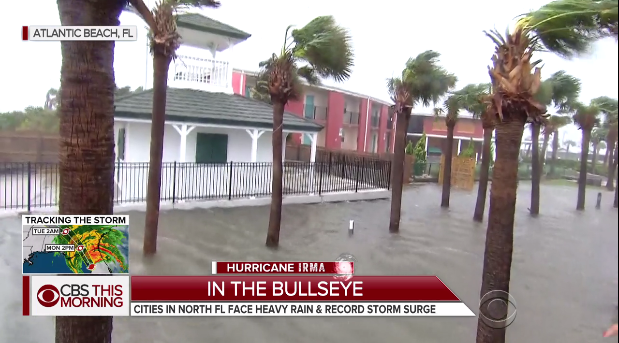 CBS News correspondent Jericka Duncan reports a lot of the roads are impassable and most of the Atlantic Beach community, about 14,000 people, are without power. Duncan says the city manager and mayor plan to assess the amount of damage Irma caused to the area, and hope to determine the safety for residents who decided to wait out the storm. Irma was downgraded to a tropical storm over Florida, but it still had winds near hurricane force at 70 mph. With rough conditions persisting across the state, many communities in Irma's wake feared what destruction would be revealed as daylight allowed authorities to canvass neighborhoods. Millions of homes and businesses across Florida lost power, and utility officials said it will take weeks to restore electricity to everyone. More than 100,000 were in the dark in Georgia. State and federal environmental regulators have issued a blanket waiver for Florida electricity companies to violate clean air and water standards without penalty for the next two weeks. No deaths in Florida were immediately linked to the storm. In the Caribbean, at least two dozen people were killed during Irma's destructive trek across exclusive islands known as the vacation playground for the rich. Meteorologists said Irma would begin crossing into Georgia around 2 p.m. The storm is expected to push into Alabama, Mississippi and Tennessee. A tropical storm warning was issued for the first time ever in Atlanta, and school was canceled in communities around the state. Irma once was the most powerful hurricane ever recorded in the open Atlantic -- a Category 5 with a peak wind speed of 185 mph.